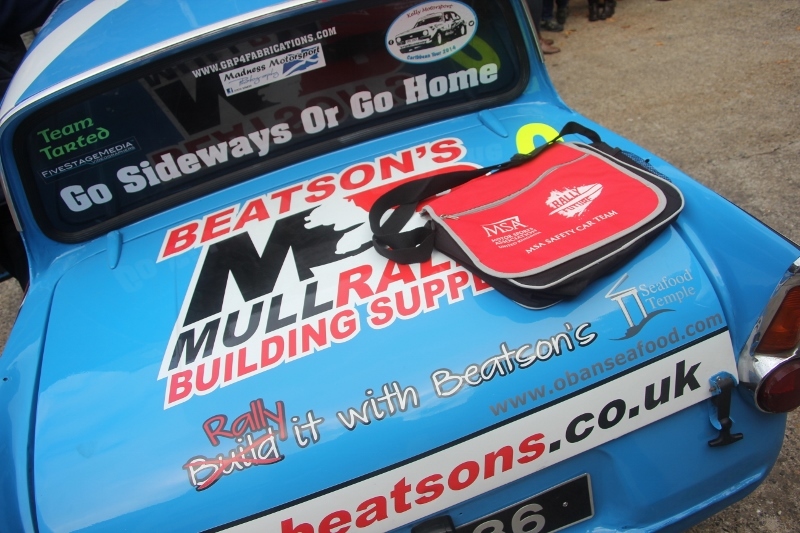 Scrutineering for the Beatson’s Mull Rally got underway at 4pm this afternoon. 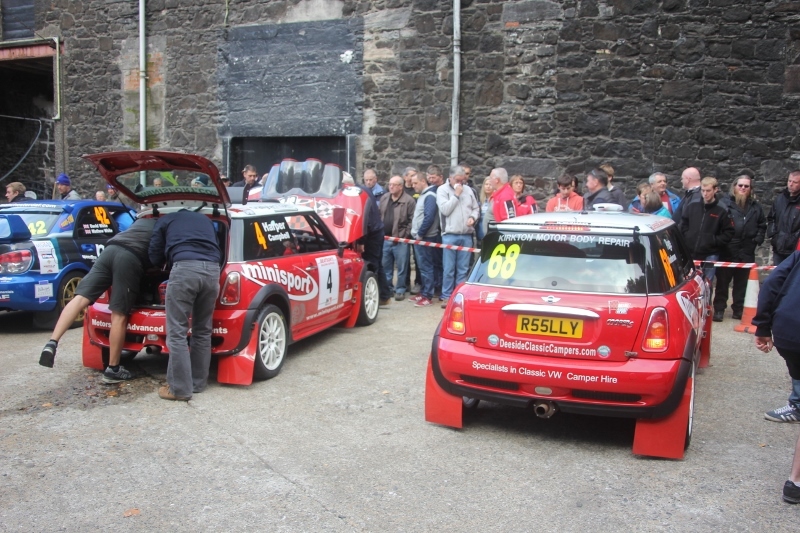 Because a number of drivers have signed up for the shakedown stage tomorrow morning, the organisers provided an extra scrutineering session this afternoon for those taking part. It not only made sense but would ease the burden on the band of Scroots tomorrow with 150 competition cars to cast their beady eyes over. 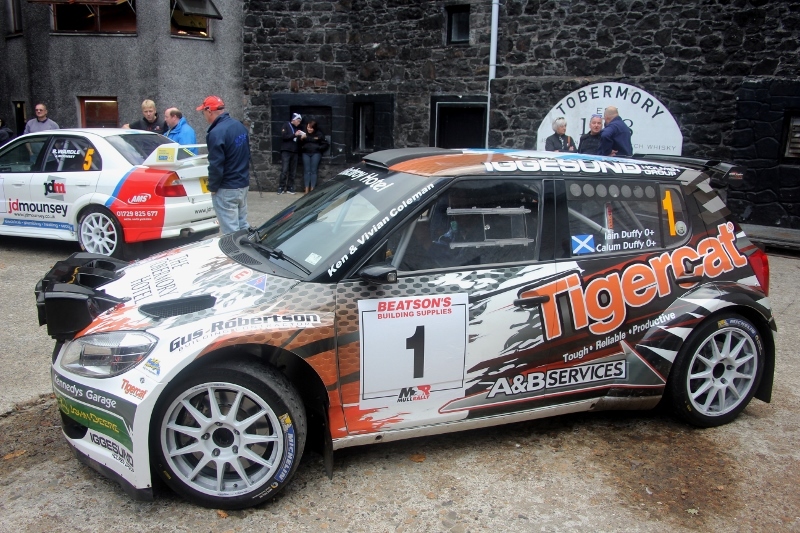 Uniquely on Mull, Rally Scrutineering is held in a working whisky distillery! 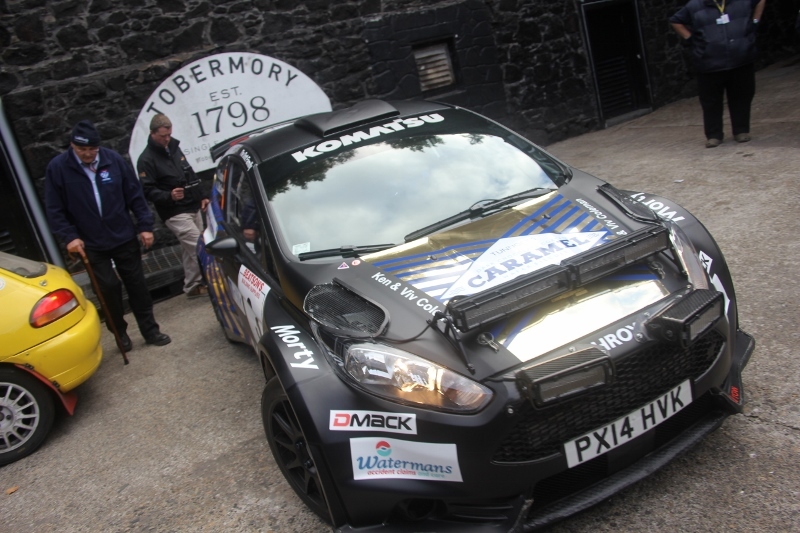 For years, Tobermory Distillery has played a most inviting host to the rally and adds its own rather special ‘atmosphere’ to proceedings. Amongst the cars being checked over was Allan MacKay’s Ford Anglia WRC (Well Run Car) as he is running Zero car ahead of the rally. He and Chris Hammill are now licenced Rally Safety Officials having passed the MSA assessment, although assurances were given that no money changed hands and that all tests were passed fairly and squarely without resort to suspicious performance enhancing substances. But Allan did express a note of concern: “They are setting Calum (Duffy) off 5 minutes behind me – no pressure then!” Indeed, methinks the prospect of the Dervaig Dervish appearing in his rear vision mirror will focus the mind. John MacCrone’s car was brought into Scrutineering by the Buckley Boys resplendent in its gold sunburst Tunnock’s livery, but it’s not the Fiesta R5 as used by Alastair Fisher in Ireland, it is in fact the car used by Garry Pearson on the Scottish Rally Championship this past season, but now converted to full tarmac set up. The Den Motorsport boys brought in both Ross Marshall’s and David Bogie’s Mk2 Escorts and the two cars looked remarkably similar in their white paint with grey and red decals, which prompted the observation - Is Ross hoping the Marshals confuse him and David and give him David’s stage time, or is David hoping to get Ross’ times? We’ll soon find out. The 3 hour session was busy, but as darkness creeped in over Tobermory Bay the crowds melted away chattering excitedly about what the morrow will bring. The pubs and bars will be busy with such chatter tonight, but drivers and co-drivers, and service crews too if they know what’s good for them, should be tucked up in bed. Ahead lies one of the most intense rallying competitions in the UK. 150 miles of stages which wouldn’t disgrace a World Rally Championship counter and it all gets underway at 7pm tomorrow evening. Oh, the final photo - It looks as though the Michelin Man has had an Irish makeover! Roll on tomorrow.